Christine is the heart of Baskets. There is no one who fills us with more hope and optimism for the future than Christine. My brother and I quote her to each other in order to lift our spirits. We look at her as an example on how to navigate the world around us. “Be more Christine,” we say. 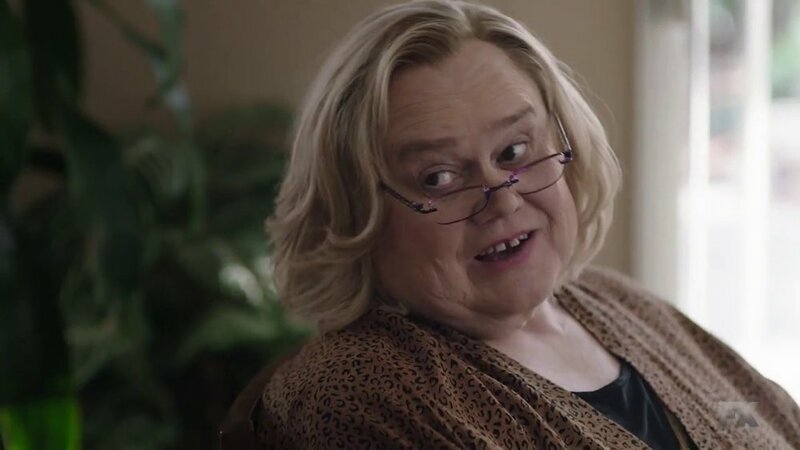 Mrs. Baskets to Penelope: "I'm not as simple as you think"
Our Costco trips will never be the same. Christine lives in the moment. She sees the brighter side of everything, fearlessly enthusiastic, unapologetic herself and forgiving of all transgressions. Forgiving of herself. Forgiving of her family. Her past is revealed to be sad. Her father was tyrannical and cruel to both her and her mother. Her marriage ends in tragedy when he husbands commits suicide early on in their marriage. Chip and Dale are both quite young. She admits that she was not prepared for the death. Her sons suffered alongside her and there is a deep seeded regret over how things were handled. Life is overwhelming. It is unexpected. Bad things happen and we are often not prepared to deal with the fallout. Injuries; death. We find a way of muddling through but we don’t know the effect that the trauma will have on our lives. We seek closure years later. Or else we look to make sense of our actions or the actions of others. Hurt follows us. Christine feels the hurt as an old woman. She is retired. Her children are grown but they struggle still in dealing with the hurt they suffered in their own childhood. They are grown but not really grown. They come back home to Christine at various intervals to put together the broken pieces of their lives and Christine does her best to support them. Her sunny disposition, so glaring at them, especially to Chip, is a difficult pill to swallow but being with their mother does them good. They learn to look at things in a brighter light. Because things can be bad but there is always tomorrow. And tomorrow. And tomorrow. Louis Anderson based the character of Christine Baskets on his mother. There is a heartbreaking realness to Christine. This isn’t a man playing a woman. This is just a woman. It is a transformative role, powerful and raw at time; hilarious and silly. I cannot imagine anyone else but Louis Anderson as Christine. I cannot imagine Christine in any other form. Here is someone who is older - past her prime - but life is still full of so much possibility for her. The joy she has with all Kirkland and Costco related products - product placement done hilariously and perfectly - reminds us that we can love those little things that make us happy “…because with Costco YOU SAVE MOOOOONEY.” Amen. There is no shame. She feels a kindship and loyalty to those simple things that make her life better. Be it the orignal Arby’s in town, or curly fries, or the way the light comes through a Disani water bottle. There is beauty everywhere if you are willing to look for it. Enjoy time spent with your family. Cherish those you love. Christine reminds me to be a better person. Try harder. Life is hilarious and sweet. It is sometimes heartbreaking but it doesn’t mean that the heartbreak needs to consume our entire lives. There are second chances and second acts. If you open yourself up to love, love will show up in the most unexpected place, such as in a jailhouse when you are trying to bail out your train hoping son after a misadventure that ends in tragedy. Christine doesn’t let Chip feel bad for himself because she doesn’t allow herself to wallow in misery. Let’s go out, let’s do something. Yes! There is always something to do. We are allowed to have fun. We are allowed to live. There is a lot of us in Christine. After my brother’s injury, it was tough for him to make sense of the pain. His body was not working in the way that he expected. It was very hard but he found ways of coping. Christine comes out of a diabetic coma at the end of season one and changes her life for the better. She starts eating better. She starts exercising. She finds a second lease on life as she tries to get better. She sees how much her undiagnosed diabetes was contributing to her mental health. As she learns to function with her new body and the tools needed to handle her illness, she finds a way of dealing with the emotional burden of her past. She let’s go. She forgives. Her mother dies and she survives that too. She cannot control her sons and she cannot fix their problems. She learns to deal with them and accept them, including their pain, because she cannot control everything and that is okay. It is not our job to fix the people around us. We need to live in the moment, accept it for what it is and look out for ourselves as best we can. We can be there for the people we love but we need to come to terms with the fact that we won’t change the circumstances of their lives. We are all our own pilots. Christine learns this late in life and takes control of those aspects that she can control. She can still change her life. In talking to her mother, who endured a terrible and abusive marriage, her mother admits “…to standing by a poisonous well for years because I was too scares to talk three miles to the next one.” How true is that of so many people in our lives? Christine can change so she changes. She allows for her sons Chip and Dale to change at their own pace. She does what she can for them, she loves them as best she can, but that is all she can do. She can’t live her life for them. She can’t control the terrible decisions they make. She is mindful of the time spent with her family. And then she finds time for herself. She wades in the quiet waters at a nearby lake when she is unable to exercise in the hotel pool. She goes out at night and finds a quiet place in which she can do her water aerobics because there are things she can control. This is her life. And this moment, as she watches the lights of the city in the distance, the world expansive like the dark waters that surround her, this is the moment that matters. Nothing else matters. Live in the moment. Live.